John Michael Kosterlitz (born 22 Juin 1943) is a Scots-born American professor o German-Jewish strynd at Brown Varsity an the son o biochemist Hans Kosterlitz. He wis awairdit the 2016 Nobel Prize in pheesics alang wi David Thouless an Duncan Haldane for wirk on condensed matter pheesics. ↑ "J. Michael Kosterlitz - Facts". Nobel Foundation. Retrieved 2016-11-02. ↑ 2.0 2.1 Gibney, Elizabeth; Castelvecchi, Davide (2016). 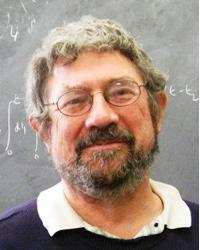 "Physics of 2D exotic matter wins Nobel: British-born theorists recognized for work on topological phases". Nature. London: Springer Nature. 538 (7623): 18–18. doi:10.1038/nature.2016.20722. ↑ "Lars Onsager recipient 2000, John Michael Kosterlitz Brown University". aps.org. American Physical Society. ↑ "Kosterlitz Research profile at Brown University". brown.edu. Brown University. This page wis last eeditit on 25 Juin 2018, at 17:09.